Virginia Falls is located on the South Nahanni River, approximately 233 km (145 sm) west of Fort Simpson; 604 km (375 sm) west of Yellowknife. The falls are over 90 meters (295 ft) in height. That is twice the height of Niagara Falls. Most visitors to the falls arrive by canoe or raft but the falls are also accessible by float plane. The most economical way to visit the falls is to reduce your time spent in chartered aircraft by either driving to Fort Simpson or flying to Fort Simpson on a scheduled air service then chartering a floatplane from a Fort Simpson based air service to and from the falls. This process usually involves more than one day and requires at least one night’s lodgings in Fort Simpson. If seeing the falls is a bucket list item for you and you have limited time to spend in the Northwest Territories we can get you from Yellowknife to the falls and back to Yellowknife in a day. This is a full day's adventure: refreshments, box lunches, and park passes are all included. We will depart Yellowknife and land in Fort Simpson just past the convergence of the Liard and Mackenzie Rivers. The MacKenzie River is Canada's largest and longest river. This stop in Fort Simpson will give you the opportunity to stretch your legs and to have the aircraft refueled. From Fort Simpson we will fly across Little Doctor Lake and to Virginia Falls where we will land. The park staff permit guests arriving by float plane approximately 3 hrs to view the falls. This provides enough time to follow the portage route and view the falls from their base if you wish. After departing the falls we will follow the South Nahanni River to it's convergence with the Liard River at the community of Nahanni Butte. We will track the Liard River until we reach Fort Simpson at which point we will head over-land flying across the Horne Plateau again on our final leg home to Yellowknife. As with our other tours you will get to experience flight on one of our iconic de Havilland Canada DHC-2 Beaver Aircraft not only providing you with a raven's eye view of region but also providing you with the experience of taking a step back in time and enjoying a flight onboard a classic aircraft. Our Beaver aircraft feature comfortable interiors, enlarged windows for easy viewing and aviation headsets for all guests to provide easy communication between guests and the pilot. Each guest is will be seated at a window seat. 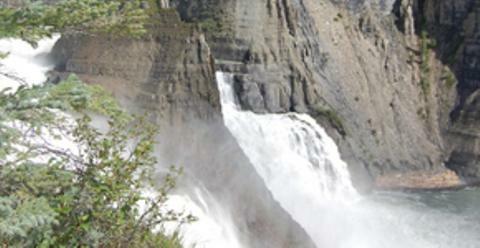 Approximately 11-12 hours depending on time spent at falls and if two stops in Fort Simpson are required.